Evernote at Work is designed to give busy professionals, entrepreneurs, and business owners a step-by-step guide to the many ways you can use Evernote in your daily work to make things easier, more effective, more collaborative, and more productive for you and your company. It’s specifically written to walk you step-by-step through many ways to use Evernote in your business. Whether you’re already familiar with Evernote or if you’re an absolute beginner, you’ll learn new ways to put Evernote to use at work – and how specifically to do it! All versions of Evernote are covered – Evernote free, Evernote Premium, and Evernote Business. Josh's book was extremely informative and has given me the proper tools to organize and manage all aspects of my of life- both personal and work. In addition, the visual guides included in the book were extremely helpful and made navigation much easier for me. A great book with useful information for a business of an size! I considered myself a "light" Evernote user since I used it to save a variety of information for related to travel, literature, movies and restaurants. A good friend recommended this book and I really enjoyed it! Working in an environment where I must implement a variety of projects, this book really described ways to use Evernote in a business setting. 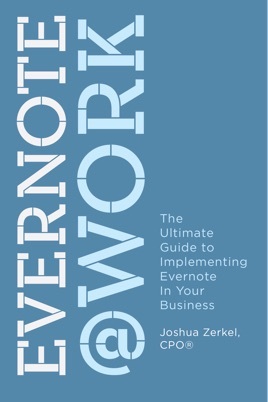 Whether for employee specific assignments, to team tasks or company wide projects, this book gives easy instructions for how to apply Evernote in a practical way to help achieve any goal you and your business may have. This is definitely a book a business may benefit from! For anyone who wants to learn how to organize their life with EverNote, this book hits the mark.